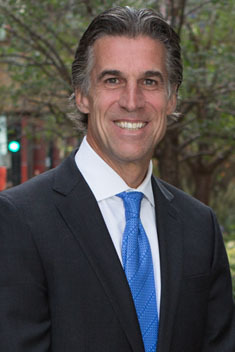 Recognized as one of the leading plaintiff’s personal injury attorneys in Chicago, John G. Kelly attributes his success to the individual attention, hard work, and advocacy he brings to representing each and every one of his clients. John began his career representing hospitals, doctors, nursing homes, product manufacturers, municipalities and insurance companies. Twenty years ago he began representing plaintiffs in personal injury cases and has never lost focus of how a catastrophic injury or loss of a loved one impacts so many lives. It is John’s empathy for others during such time that drives his daily quest to bring closure and just compensation for his clients. “Meeting and working on behalf of people who are suffering or grieving a loss as a result of another’s wrongdoing, is as heartfelt an experience as anyone can have. As their lawyer, it is as high a professional honor as one can achieve to redress such a wrong”. John’s practice in the medical malpractice, nursing home, and all areas of personal injury spans 30 years and over several local jurisdictions and states including Illinois, Indiana, Wisconsin, Florida, Utah and others. His success has resulted in tens of millions of dollars awarded to the firm’s clients. His record separates him from his peers. Clients consistently praise John for his empathy and understanding of their unique situation and advocacy on their behalf. His results and expertise in complex legal/medical matters are some of the reasons he has been recognized by Martindale Hubbell®, Illinois Super Lawyers®, AVVO, insurance companies, defense lawyers, and judges with consistent high praise and the highest regard. Born and raised in Chicago, when not working on behalf of clients, John has given his professional time and expertise to multiple charitable and pro bono organizations including the Arthritis Foundation, Chicago Volunteer Legal Services, Habitat for Humanity, Catholic Charities, and others. He has been married for over 25 years to Sheila, a senior executive at one of Chicago’s largest businesses; and has twin adult children . John welcomes the opportunity to speak with you and help in any way.